Our content director is running a Halloween race this October just outside New York City. See why it’s her favorite, and hear from the race director to find out what it takes to put a massive event like this together. Have you heard of the HoBOOken 5k? No? Now, let me be clear before going any further: I am very biased towards this race. I’ve run it for the past few years, and last year I did it with my whole family for the first time. Scheduled every year just before Halloween in Hoboken, New Jersey, it has about 1200 participants, it’s filled with mostly locals, and I love it with the fire of a thousand suns. Here’s why I personally love it, followed by an interview with the race’s director. Speaking of money, Karin Romans has been working in fundraising for 15 years, and is currently director of development at a national nonprofit called Schools That Can. But in her spare time, Romans has taken on the awesome task of volunteering as race director for the HoBOOken 5k. A lot goes into planning a successful race in a highly populated urban area, and Romans was kind enough to take the time to answer a few of my burning questions about the 8th edition of this very unique annual event. Q: How long has the HoBOOken 5k been going, and how has it grown? Karin Romans: The race was launched by the Hoboken Elysianettes in 2010. In 2015, the Elysianettes passed on the race to a group of five volunteers, and since then it’s been managed by the Hoboken Shelter volunteers. My husband and I have been involved since 2015 and have organized the race each year. It’s grown in both size and the amount that’s given to the Shelter. In 2015, we crested giving $50,000 back to the Shelter for the first time and this year, we’re hoping to give $70,000 back. Last year we raised $65,000 to support Shelter programs. Today we have over 1,500 runners and about 2,000 people out on the Pier. Last year, thanks to the involvement of Little Hoboken, we grew our one-mile kids’ race, called the Scary Scurry Run, from 100 kids to nearly 300. 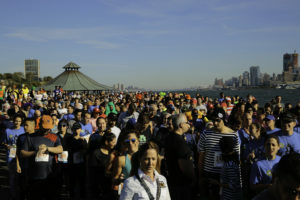 The race is fast becoming a Hoboken tradition with great support from Hoboken businesses, residents and community groups. We’ve also really grown our group of volunteers. What started nearly five years ago as five volunteers to become a group of nearly 15–20 dedicated individuals who donate their time and expertise from May through November each year to see that this event is successful. Q: Do you run? If so, do you wear a costume? Q: Any favorite costumes you’ve witnessed over the years? Q: Do you have any protips for someone participating in this year’s 5k?